Tradeshow season is here! That means weekends of bin schlepping, booth building, inventory hauling and client chatting. Hours aside, tradeshows are particularly challenging because of space and transport constraints. How do you best display your product while also taking into consideration transport and cost? 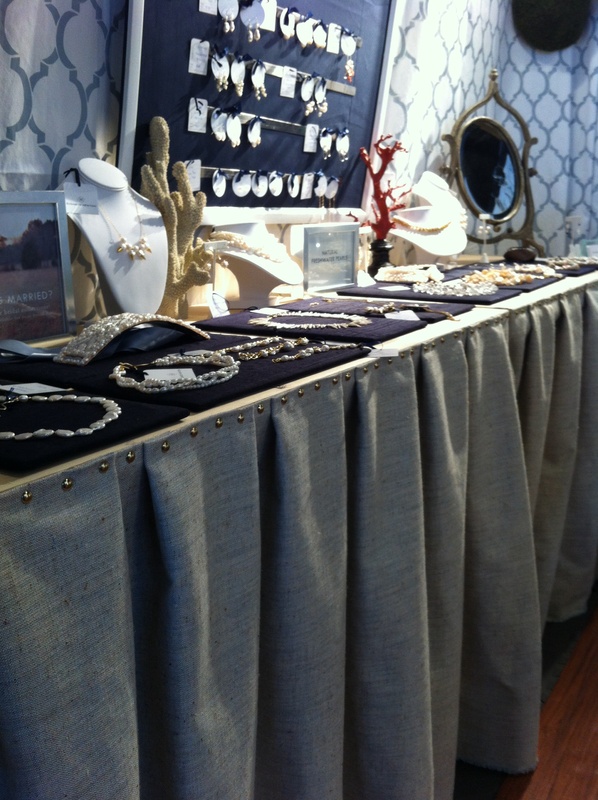 How will your booth convey your brand to a shopper unfamiliar to your product? 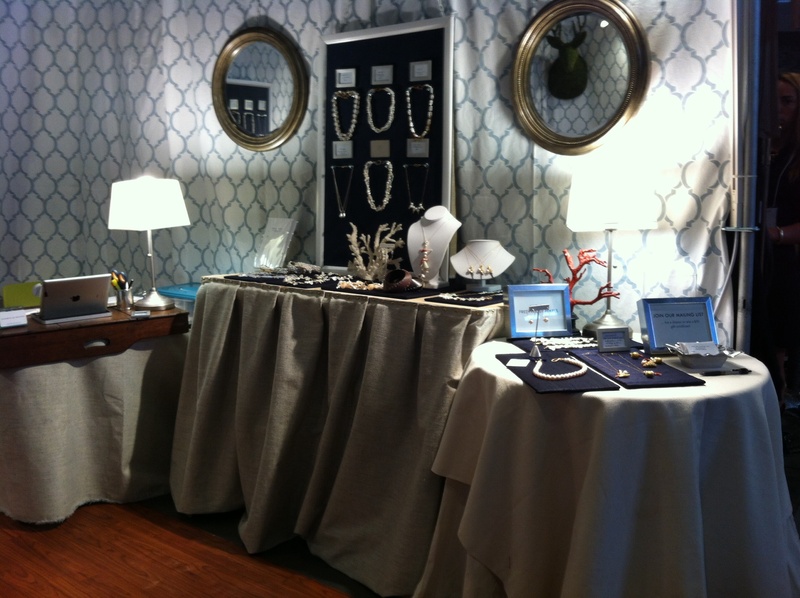 Personally, I designed 2 booth layouts – one for my museum shows and one for my gift shows. Both have different needs and arrangements: my museum booth is a bit more formal- glass cases, minimalist decor with an emphasis on the product. My gift booth is boutique like – graphic and punchy with an emphasis on servicing lots of shoppers at a time. 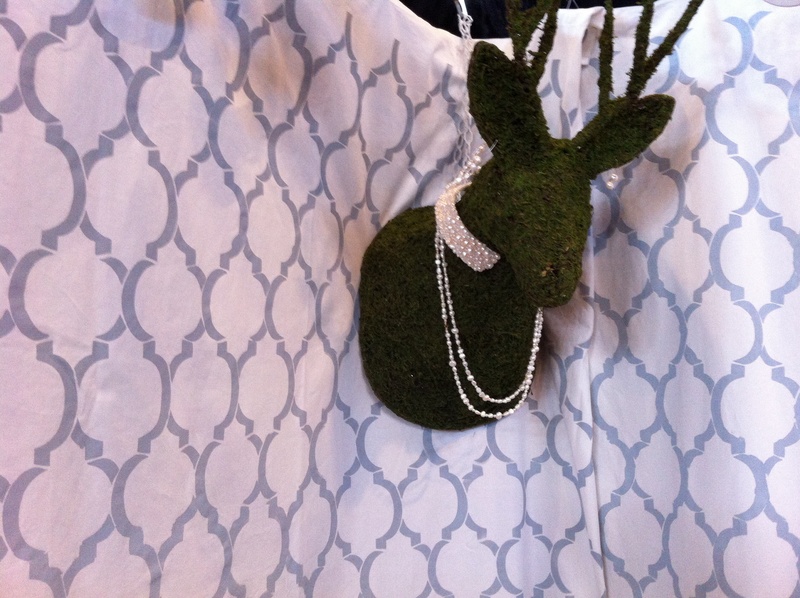 I spruced my gift booth this season: tired of ironing table skirts, I purchased yummy birch boards and pre-skirted them with brass upholstery tacks and fabric (thank you fabulous bolt of fabric found for $10 at Habitat for Humanity). Frustrated with my tired flooring but not wanting to spend oodles, I purchased hardwood vinyl from Home Depot to achieve a polished look on a budget. Seeking to maximize customer’s ability to shop, I built and framed lightweight hanging boards with easy access display and information cards. 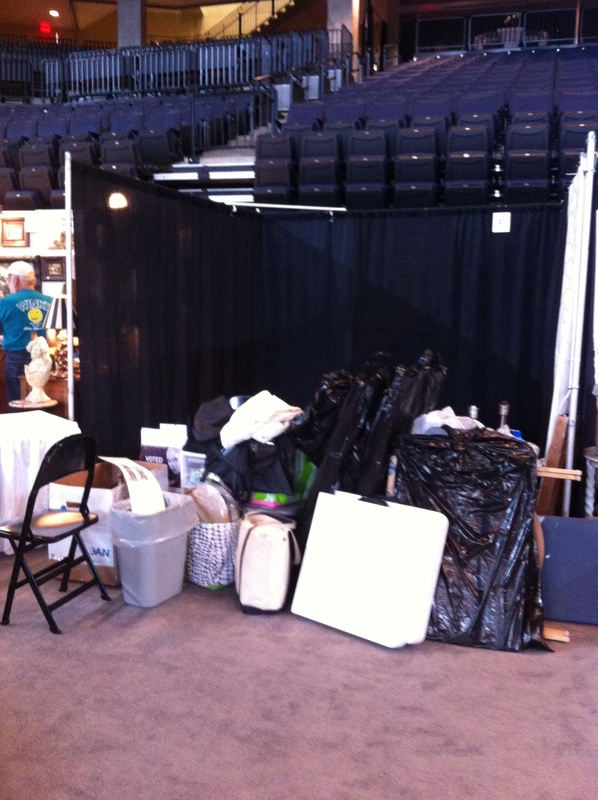 Check out the transformation of the gift booth below: I’m thinking we are pretty close to being spot on! Whatcha think?! After: polished, skirted, lit, floored and fluffed. Many things, including the backdrop are carried over from last year: unable to find fabric at a cost I wanted, I handpainted Ikea curtains using an oversized stencil, fabric paint and a roller. Because it is unusual, people can easily spot me at the show, and find me once again the next year. I suggest a combination of lighting – I install tradeshow lights on rails above, halogen spotlights on each board and lamps on tables to soften the look. No more ironing!!! Upholstered skirted table tops are super cheap to make, easy to install in the booth, and look awesome. 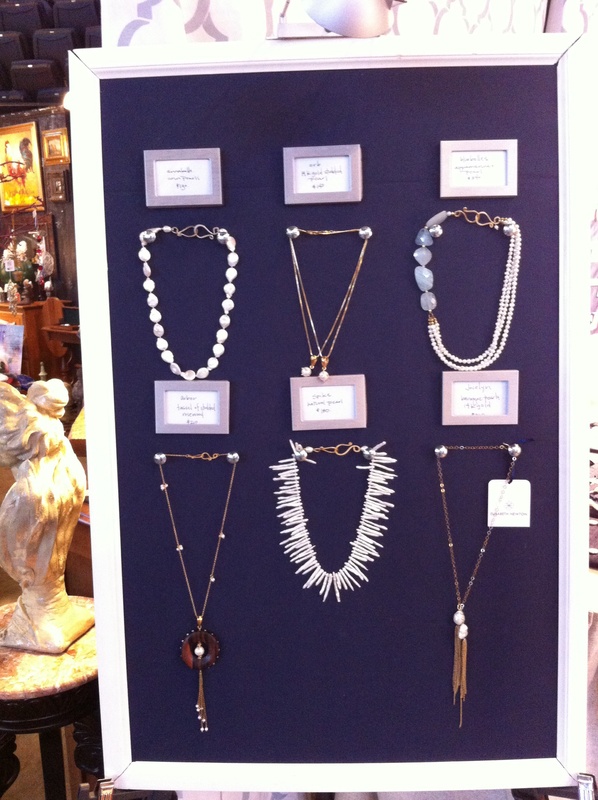 Necklace boards take advantage of vertical space, allow necklaces to hang as they would when worn and provide easy access for buyers. One thing I have learned over the years is to people proof EVERYTHING – if things wiggle, people will be afraid to touch, if prices are not easily accessed, people will walk away, if items are not displayed as they are worn, people cannot envision how they will look on themselves. Make sales easy! We’re so glad you’re here Elisabeth! Thanks for sharing the transformation! Oh golly, please do! Email me any time: people were kind enough to help me when I had questions – I’d love to pay it forward and do the same. Am happy to share! Where in Chapel Hill, NC will you be in November? Is it s gift show open to the public? Booth looks FAB! Do you have a post somewhere on “how to make” the Upholstered skirted table tops?? Doesn’t look so easy but would love to give it a try!! Thanks Shelly! I don’t have a link up currently, but I will do a post for you to show you how. It is actually super easy and cost effective to do. 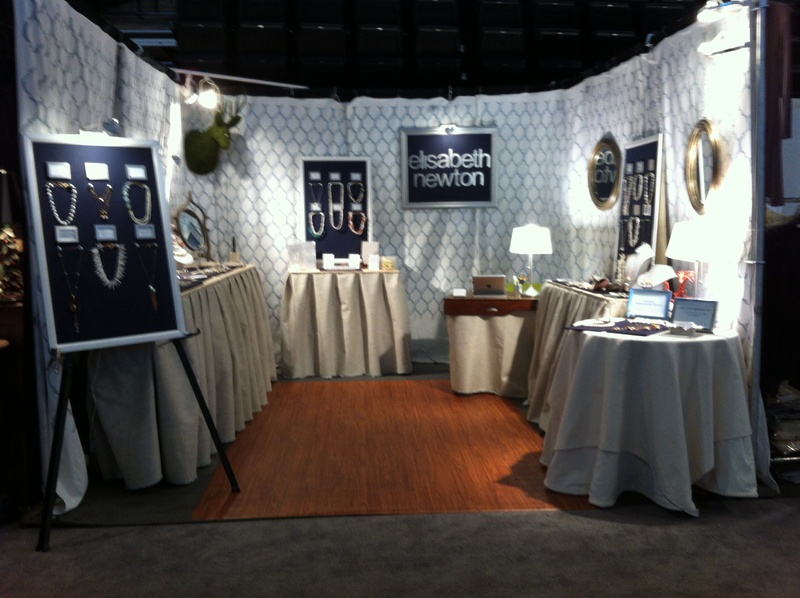 This entry was posted on October 5, 2013 by elisabeth in news and tagged gift shows, jewelry display, trade show booth design.